Home→Blog→Take Advantage of What You Have! Take Advantage of What You Have! Set your expectations high but not so high that they cannot be achieved. If you do not have the genetics or nutrition (correct mineral or food sources) for 200″ deer in your area chances are you may never have the opportunity to harvest one. Killing a mature deer, 3 1/2 – 6 1/2 year old doe or buck is not an easy thing to do. You have to be patient and let the smaller/younger bucks walk. Every year try to harvest a buck a little bigger than the one you harvested the year before; then you will have a clear/attainable expectation set for yourself. Try to get your adjoining neighbors/property owners on board with a size restriction or quality deer management plan. Depending on the area you hunt, it could be a six point restriction or an eight point “at the ears” restriction; that is something you will need to determine. If all of your neighbors are not willing don’t worry about it; if you can get at least one of them on board it is a start. Once you start killing “big” deer they will notice and jump on board; although it may take some time…be patient. If they harvest one of the “big” deer you have been seeing, congratulate them and remind them of the restrictions on your land and the adjoining lands; try to get them on board. 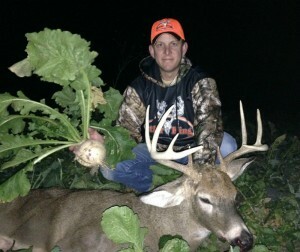 If you can plant a food plot….DO IT! This will ensure that you will have a food source when all others sources such as agricultural and natural food are gone. It not only gives your bucks the nutrients they need to maximize antler growth, but it gives your total deer herd the nutrition to stay healthy. If you have your own land or can gain permission from the land owner it is a project you will not regret. You do not need a degree in agronomy or horticulture to be successful at food plots. There is a ton of information on the Antler King website and all of the employees and Pro-Staff at Antler King are willing to help in any way they can. Never be afraid to ask for help. Scout and plan your stand locations early; don’t wait until the last few weeks before season to start. I scout year around and always select my permanent stand locations early, trim my shooting lanes and have a contingency plan. With that I mean I never leave home without my climber stand in the truck. The best laid plans seem to always go South at some point and the deer just don’t do what they should; I want to be ready for anything and if that means slipping into another area I want that option. Summer time is a great time to attend a deer Expo and ask questions, there is a ton of information at the free seminars and booths. I have attended these Expo’s as a spectator, worked at the Antler King Booth, given seminars on food plots and how to hunt them; I always learn something new. It is definitely worth the price of admission. I would rather eat my buck tag as to shoot an immature buck. These “smaller” bucks will be bigger next year and the year after that. Remember don’t set unobtainable expectations and be happy with your harvest and don’t compare it to your neighbors deer; all deer are trophies in my book! I hope some of these tips will help you in your quest for a “big” deer. Hopefully we will have a chance to talk at your local or state deer expo, I look forward to it!